Have you ever noticed that sometimes you have two employees doing the same task? Have you had one department in your company make a decision that worked well for them but caused another department to fly into a frenzy? Perhaps it’s time to take a closer look at your business processes to see where they’re working – and more importantly, where they’re not. 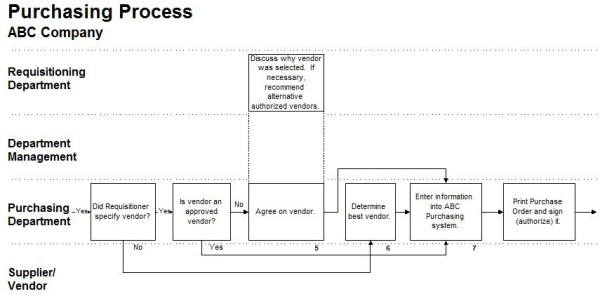 Process maps like the example below are part of a Process Improvement Report. They document how your business completes work and illustrate areas for improvement. A process improvement project, also called a process characterization or mapping project, is the orderly assessment and documentation of operational procedures and relationships. A Process Improvement Report, which is delivered to you at the end of the project, gives you an overall view of your business processes, a specific indication of areas that need improvement, and a picture of the parts of the process that work well. Before a process improvement project begins, you identify your improvement objectives. Reduce your cost for customer support? You also identify any “wrong colored rocks.” These are what we like to call the off-limits solutions. For example, you may decide up front that you will not hire additional employees or purchase new manufacturing equipment. This will encourage the team to identify alternative solutions. During the project, interviews are conducted with your employees. The information is summarized into process steps and issues, including easy-to-read graphics or maps that show how your business works. The project facilitators will conduct team meetings to review and refine the maps and findings, identify action items, and capture suggestions for improvement. You may be surprised to see your employees discover – for the first time – the double-work and disconnects built into the system. The team will recommend solutions and action items. How does a Process Improvement Project identify things you don’t know? Most departments manage their own job functions very well. However, it is possible for each department to exceed all of its goals while the overall system fails to meet management or customer expectations. This is called local optimization. It may occur due to inadequate communication, improvement efforts that are not optimized across functions, or a lack of strategic alignment of goals among departments or functional areas. Disconnects where critical information is not communicated. Situations where consequences of one department’s decisions are not fully understood in the light of their impact on other departments, potentially hindering the other departments’ ability to achieve their goals. Setting aside the time and resources to focus on the overall business during a process improvement project creates an opportunity for your employees to understand the business and accept responsibility for improvement. Encouraging input from all participants. Creating a positive atmosphere focused on improvement instead of blame. Thinking creatively to overcome obstacles and keep everyone focused during the team meeting. What happens during a Process Improvement Project? It usually takes about a month to go from identifying the improvement objectives and the team members to completing the team meeting and final report; however, every phase of the project is directly impacted by the number of people to be interviewed and the scope of the process. Each interview is 30 to 60 minutes, and the As Is map review and team meeting requires about four hours. Although this sounds like a long time, the meeting is very dynamic and includes a lot of involvement from all interviewees. The optional “Should Be” team meeting takes two to three hours. The management review of the final report requires an hour or less. “As Is” process map: The “As Is” process maps document the flow of the work as it exists before improvements are made. The maps, based on the Rummler-Brache methodology, depict the flow across departments and functional areas. List of Disconnects: Areas where process steps are missing, deficient, or add no value are graphically associated with the process on the maps; these areas are good targets for process improvement. Findings Summary: Grouping of disconnects into categories called Findings. Suggestions for Improvement: Suggestions made by Team Members during interviews or as part of the Team Meeting. “Should Be” process map: The “Should Be” map documents the ideal process for the future. Action Items: This lists the steps identified by the Team to move towards the “Should Be” process and eliminate the disconnects defined during the “As Is” meeting. We do more than identify ways to streamline your business and improve your efficiency. A process review is very useful as a first step in developing a system requirements document, defining and documenting work procedures, and enhancing employees’ understanding of the overall business. DragonPoint’s team has used its standard business process improvement methodology to conduct more than 50 process improvement projects for manufacturing, service, construction, and high technology companies. Call our office in Florida today at 877-542-0657 to find out more and determine whether process improvement makes sense for your business.